The Roman Candle is the exclusive alcohol caterer for Madison Children’s Museum. Any and all alcoholic beverage service must be sold and served through The Roman Candle. If you do not plan on having alcohol at your event, non-alcoholic beverage service may be arranged with the approved caterer of your choice. 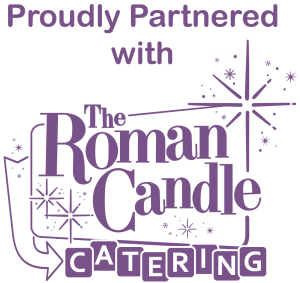 To reserve your bar service needs, please contact: Roman Candle Bar Catering barcatertiner@theromancandle.com. Can we use glassware from bars throughout the evening? Due to the space being shared with children every single day, MCM does not allow glassware to be served from the bars during events. The Roman Candle provides a compostable cup to serve beverages out of that is visually appealing and aligns with the museum’s sustainability mission. The exception to this is during sit-down dinners, when clients may choose to have water and wine glasses that remain at their tables. Can we have beer /kegs/wine on reserve? We do not have a reserve policy for kegs or wines. We carry all of our standard offerings from our bar on reserve at all times. Our event coordinators will work with you to determine the amount you will need of special order items, but all other items will be in stock. When do we have to pay the bar? A non-refundable credit card deposit for the total of the estimated event minimums is required to secure bar service for the date of your event. All deposits will be applied towards the final bill. If any catered function is cancelled within 10 business days of the scheduled event there will be no refund of any deposit. Payment may be taken with cash, check or credit card. For any event with cash or combo bars, we will charge you the required event minimums and refund the difference once we tally event receipts. Can we have wine/champagne service during dinner of our event? Yes, we can provide wine service at tables during dinner for a flat rate. This service includes wine/champagne ONLY. Any other drinks will need to be ordered at the bar during that time. Note, with the addition of wine service, we highly recommend ordering more bottles of wine than you may normally if guests were just ordering from the bar for the evening. Can we return anything that is unopened? In compliance with the State of Wisconsin liquor policy for alcohol caterers, unopened alcohol cannot be returned for a refund. Special order items, if not consumed, can be charged to you and you can take them home at the end of your event. Can we bring in alcohol that we’ve brewed ourselves or from a family member who works at a brewery? Can we get alcohol donated if we are a nonprofit or from an alcohol sponsor? In compliance with the State of Wisconsin liquor policy, we do not allow ANY carry-ins or donations for our facility rentals. This includes events hosted by nonprofit organizations, who are looking to have alcohol donated by sponsors. We also cannot allow any alcohol as favors for your event. All alcohol must be ordered and served through The Roman Candle the evening of your event. We will gladly work with you to source products for your excellent tastes! Can we have a cash bar at our event? Yes you can! In conjunction with The Roman Candle, we now have a liquor license for the MCM premises and can do both cash and host bar services. Is gratuity included with the service fee? Gratuity is not included with the service fee for your event. Our bars typically put tip jars out, unless the client requests otherwise.